The first volume of the new book series Peripherien. Beiträge zur Europäischen Geschichte (eds. Christof Dejung, Johannes Feichtinger, Martin Lengwiler, Ulrike Lindner, Bernhard Struck, Jakob Vogel) has just come out. It is entitled: Ränder der Moderne. Neue Ansätze zur europäischen Geschichte (1860-1930), eds. Martin Lengwiler & Christof Dejung (Cologne Weimar Vienna: Böhlau, 2015). The book series has grown out of our GRAINES network and the shared interest in European history in transnational perspective. European history, as we see it, needs to respond to and reflect on the recent trends in Global History. What we aim at is a series that combines monographs and edited volumes that highlight the polycentric and provicialised nature of Europe. 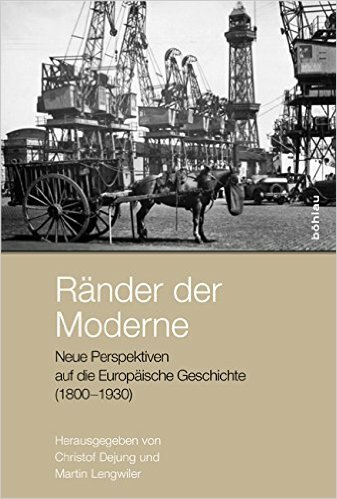 The first volume combines chapters that refer to transnational, postcolonial, and global history approaches, in oder to develop new perspective on European history. At the same time, the volume follows the idea to approach Europe from the margins, with an aim to flesh out similarities within Europe as well as conflicts beyond Europe.